If you’re not comfortable in the registry or just want to make things as quick and easy as possible, we’ve made a small registry file. Simply download and double click the file to import the ShowLanErrors value into your Windows XP, Vista or 7 registry. There’s also a .reg file should you wish to turn the error display off again. Alternatively, please follow the instructions carefully as editing your registry incorrectly could cause problems. 1. Press Win key+R to bring up the Run box and type regedit to launch the Windows registry editor. If the StatMon key is not there, right click on Connections, select New -> Key and enter the value as StatMon. 3. Inside the StatMon key, set the ShowLanErrors DWORD value as 1 if it’s already there. If ShowLanErrors is not there, right click on StatMon and select New -> DWORD value. Set the DWORD value name as ShowLanErrors. Double click on ShowLanErrors and set the value data as 1. To turn error count off again, just set the ShowLanErrors DWORD value to 0. Microsoft claims that because most users do not need this information and might find it confusing or misleading, error counts do not appear by default. It certainly can be useful in diagnosing the network reliability though and should be enabled by default, or at least have a tick box somewhere so you can turn it on easily. You will now see an additional Errors information in your connection status below the Sent and Received Bytes. If you still can’t see anything, restart your computer although the effect should be instant when you right click and select Status. Unfortunately there is a drawback with the packet error display which is not every version of Windows will show the errors. It is known to display on Business, Professional or Ultimate versions of Windows XP, Vista or 7. Windows XP Home and any Vista or 7 Home editions we believe don’t work. Also, this registry edit seems to have no effect in Windows 8, we tried on Windows 8 Pro x86 without success. 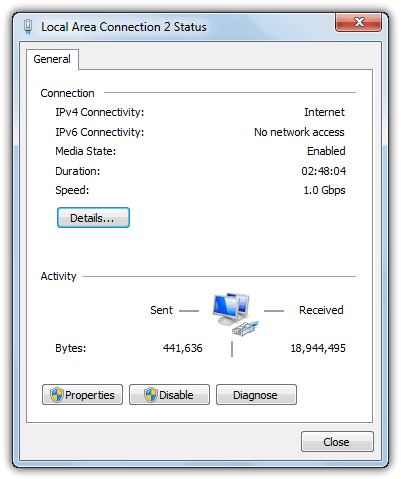 When connected via VPN, the connection status window also shows the error. 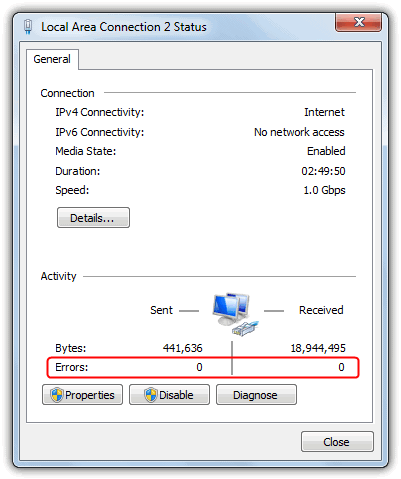 It appears that as long as you have a connection that goes through your network interface card (NIC), it will show the error information. In addition, the connections that can display the errors also include USB ADSL modems and WiFi adapters etc. Still works on Server 2016. Many thanks. Very helpful, ty! Am running W7 Pro sp1, x64. Chose manual regedit solution and it worked perfectly. BTW, had to create both StatMon and ShowLanErrors. For ShowLanErrors had choice of Dword 32 bit or Qword 64 bit. Since this change was OS related selected Dword 32 bit. win 7 sp1 x64, works! Thank you! Worked like a charm on Win7 Pro and Win2003! Eh, folks… This works perfectly fine on any Windows starting with 2000 and ending with 2008.
it works in vista ultimate Sp1. FYI: no need for a reboot on WinXP here. It showed up after adding the Regkey. You don’t need to restart your system. After editing the registry (XP SP3) it showed the Errors right away. Just needed to close/open the status window.